I know very little about this release, at least in terms of specifics. I do know that it’s the work of the prodigious John Tuffen, who also performs as part of Neuschlaufen and Wharf Street Galaxy Band amongst others. I know its physical edition is in a hand-numbered run of 50 CD-R, housed in a paper foldover sleeve in a PVC wallet, with an appropriately blank image by way of cover art. There’s a bleak, quasi-modernist feel to the night-shot photograph of a structure constructed as some kind of shelter. But a shelter without people and a car-park without car is simply dead space. 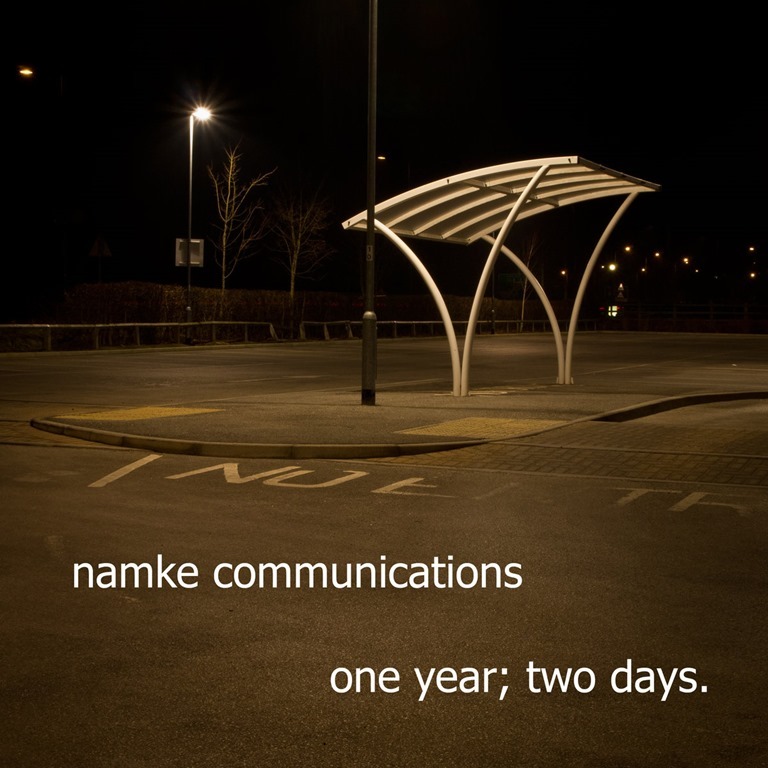 One Year, Two Days is a night-time work. Recorded at night (we’ll return to that shortly), it’s the soundtrack to empty spaces and time without people. And abstract as the sound sequence are on One Year; Two Days, it’s reasonable to summarise the project as a work about time and space and a certain absence. I do know that John likes his kit, and to fiddle with it, and that a lot of his works are ‘project’ based, centred around either a piece of equipment (e.g. 808 // Whammy (2016) and Field Memory Recorder (2017) recorded exclusively with a novation circuit) or specific times / locations. I also know that John has been working under the Namke Communications moniker for some seventeen years now, and has built quite a body of experimental work in this guise. The track titles are simply dates and times, and show that the four pieces were recorded over two days in 2016 – as the EP’s title suggests. In some ways, it marks a continuation of the 365/2015 project, which saw Tuffen record – and release – a track a day for the entirety of 2015. This project and its predecessor provide a considerable insight into Tuffen’s creative modus operandi, which could equally be described as a work ethic. It’s one I can personally relate to, as I strive to produce and publish at least one review a day. This does, of course, raise the inevitable question about quality control, but there are two very different positions on creativity: the first suggests creativity is something which cannot be controlled, is spontaneous. It says you have to wait or the moment, the idea, the impulse. To wait and to go with the flow. The second says that creativity is like a muscle: the more you do, the more you’re able. In time, quantity begets quality as a committed, systematic approach to making art. ‘2016-08-08-2202’ sets the tone, a distorting oscillation provides the backdrop to creeping notes which gradually rise majestically before bleeding into ‘2016-08-08-2318’. It may be growing later, but the mood grows marginally lighter. The sequencing of the tracks is a major factor in the listening experience here, as there is an overall arc from beginning to end. The mid-section, as represented by ‘2016-08-10-1909’ transitions into hushed ambience, before fragmenting into darker territory with fractured distortion and dislocation taking hold. Eventually, it spins into hovering metallic drones, the frequencies touching on the teeth-jangling. The final track, ‘2016-08-08-2256’ forges a cloud of amorphous sonic drift, a sonic cloud without tangible form. It’s immersive, but at the same time entirely engaging, as the oscillations and quavering notes which fade in and out of the rumbling thunder slowly dissipate in a drifting mist. While locked in time and space in terms of their creation, in terms of reception, the four tracks on One Year; Two Days transport the listener beyond both time and space. And herein lies the power of this release, in that it both freezes time, and stretches it out over a frame which has no fixed limits.